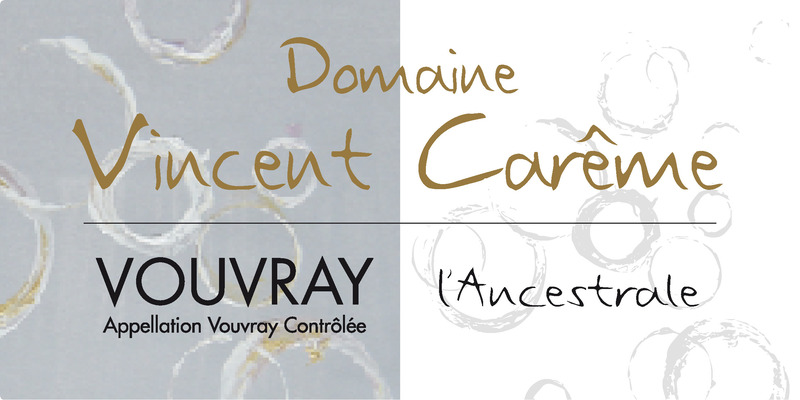 Vincent and Tania Careme inherited 5 hectares of vines in prime Vouvray terroir (just east of the city of Tours) from Vincent’s parents. They have since bought more vineyards and rented some as well to give a total of around 15 hectares which includes the superb Le Clos terroir.Their cave is very old. It is carved into the tuffeau cliffs just near the village of Vernou. 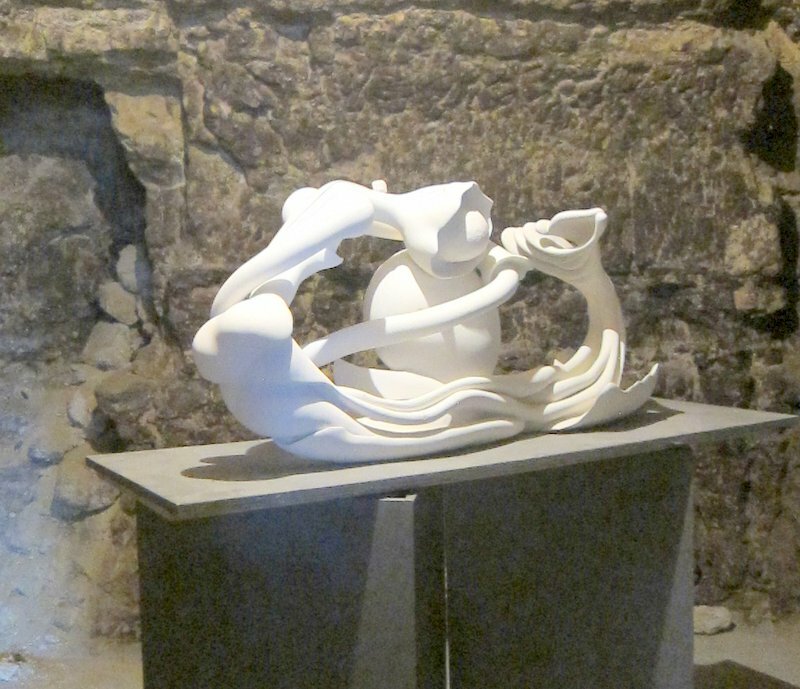 Inside the cave there are some extraordinary sculptures carved by a friend called Olivier Masson. Vincent is passionate about the wines he makes and the vineyards that he cares for. All their wines are made from Chenin Blanc (the white Orbois grape is also permitted in this appellation) and they produce both sparkling and still wines. The wine is matured in oak casks, the majority of which are old (up to 10 years old) and a small proportion (around 10%) of which are new. The grapes are picked by hand and pressed gently and then the natural yeasts are allowed to do their work. The vines grow quite near the cave (some of them) overlooking the cliffs that line the Loire River in this part of the valley. Limestone rocks litter the surface and solid limestone is never far below the surface. 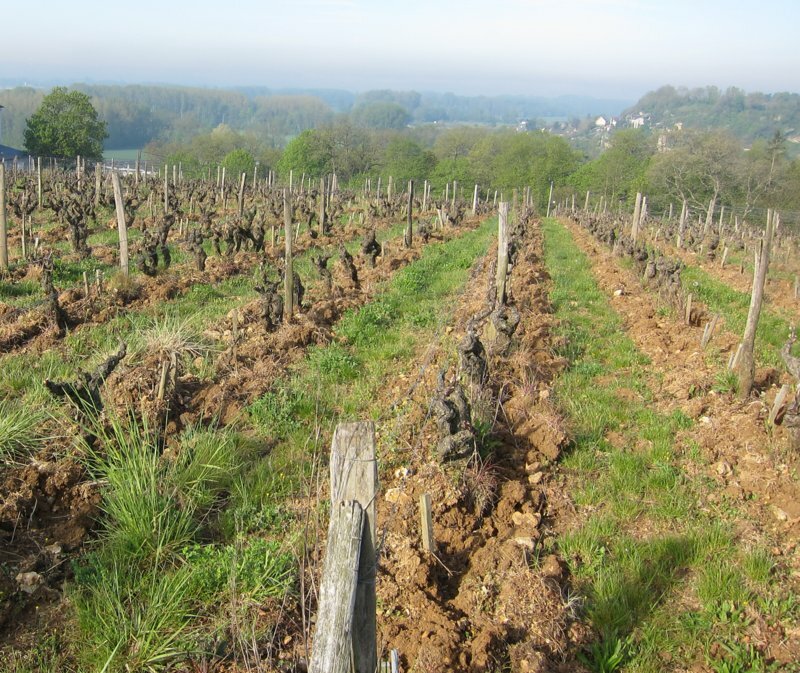 The Le Clos vineyard as well as a new vineyard Vincent has just planted are near the cave, but he also has vineyards in Vouvray and Noizay which lie on either side of Vernou. The Brut is a natural dry sparkling wine created using only the natural sugars in the grapes. No sugar is added at any stage in the process. Despite that there is a little residual sugar left in the wine (even though it qualifies for the Brut nomenclature) which is balanced by beautiful acidity which runs through each mouthful. The vines give this wine a fruity character and it exhibits very fine bubbles. As with all Vouvray wines this one is made from Chenin Blanc. This is a delicious sparkling wine that displays complexity and finesse. It is back! The l’Ancestrale is a natural sparkling wine made in the pétillant style. The fermentation starts in tank and the wine is then bottled while still fermenting (at around 18-20 grams sugar) and then finishes in the bottle without the addition of any sugar and using only the natural yeasts. Vincent actually uses a small heater to keep the temperatures in his tuffeau caves to 14C to ensure that the fermentation continues during winter. He then disgorges (removes the sediment) from the bottles tops then up, seals them and puts them away for two years to mature. Despite this there is a tiny amount of residual sugar (the very hot year meant that there were fewer yeasts on the grapes) which gives the wine a pleasant balance due to the lingering acidity. This is an incredibly elegant wine that displays a distinct minerality and a very fine bead. There are no sulphites added to this wine at any stage in the winemaking process. This is a very popular wine in Australia, so make sure you let us know if you would like some. The Fizzy Pink is a more simple, fun wine than the Ancestrale – perfect for spring picnics. Vincent normally only makes it for local consumption, from their cellar door or in the nearby city of Tours – it’s never been exported – but we convinced him to let us buy a little. It’s right up our alley for uncomplicated, easy drinking sparkling wines. As the name implies it is a deep pink wine made from Côt (the local name for Malbec), Gamay de Bouze (a teinturier grape variety that has red juice), Cabernet Franc and Grolleau Gris. It has just 6 grams of residual sugar. The Tendre is a traditional still wine from this domaine made from older vines that grow in soils ranging from clay to flint. It is a semi-sweet wine (around 20 grams per litre of sugar) but with a dry finish and wonderful depth. This wine displays rich flavours gained from the beautiful soil in which the vines grow and the minerals contained in those soils. Chenin Blanc is a perfect grape variety for producing sweeter styles of wine. The Tendre that Vincent makes is a semi-sweet wine that is perfect for pairing with desserts or cheese. This one, however, is a fully sweet style. “Trie” refers to sorting and for this wine Vincent selects only the most concentrated grapes, picking several times and only picking bunches with at least 30% botrytis. It has 100g of residual sugar and tastes like quinces. It’s a wine that should age for many years, but is also drinking beautifully already. It is a very good wine for restaurants as it can be poured by the glass and lasts for ages after the bottle has been opened. 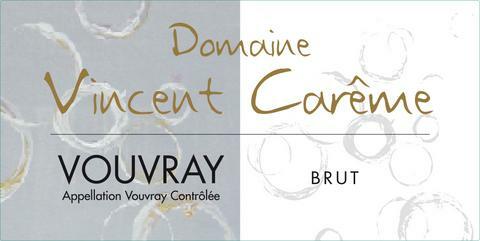 We are so happy to have stocks of this recently a premium Vouvray from Vincent Careme. Le Peu Morier is a still, dry white wine made from old Chenin Blanc vines that thrive in a terroir rich in flint and situated on some of the prize slopes of the famous Vouvray appellation. The wine is matured in oak barrels for 1 year and is then transferred to tanks for 12 months to ensure that all of the lees are deposited before bottling. It displays very mineral overtones and notes of citrus and white fruits. It is a very complex wine. Deep wild-meadow honey and herbs and quince. Compelling aromas that saturate the senses. Clementine and lemon and lace-spun edges and finely stitched seams. Crisp, tightly furled, fine as blown glass. Impossible to spit. A wine you want to dance across the room with. The Careme Sec is a dry white wine that displays notes of pear and wild peaches. From interesting flint soils in both Vouvray and Noizay it has a generous palate and displays rich fruitiness and citrus overtones. It is a wine for drinking now. 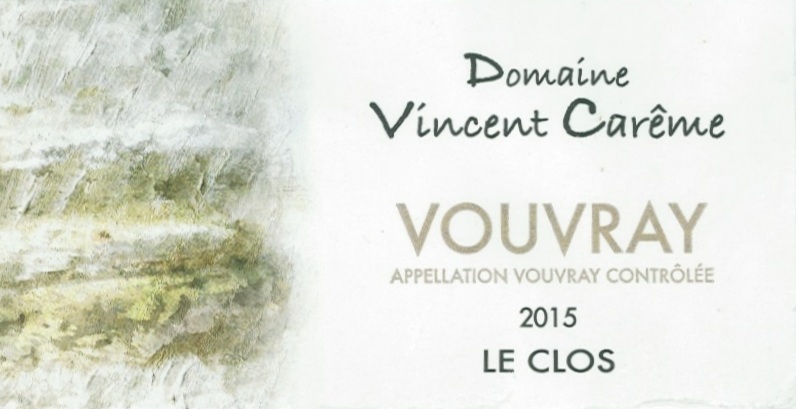 Vincent Carême is a new name in Vouvray; he is a young producer of the classic Chenin Blanc at the heart of this chalky region just outside Tours – and one to watch. With layers of crisp apple and waxy, honeyed richness, this has all the racy acidity expected of this grape variety, complemented by a long, elegant finish. The Le Clos is Vincent’s top premium wine from his favourite vineyard that sits high on the slopes overlooking the Loire River. This vineyard can be seen in the photo in the introduction to these wines. The yields from this vineyard with its 60 year old vines are very low at only 20 hectolitres per hectare. It is a dry white wine made entirely from Chenin Blanc grapes from the flint, clay and tuffeau soils in the Le Clos vineyard that displays notes of pear and wild peaches, a generous palate and rich fruitiness along with citrus overtones. 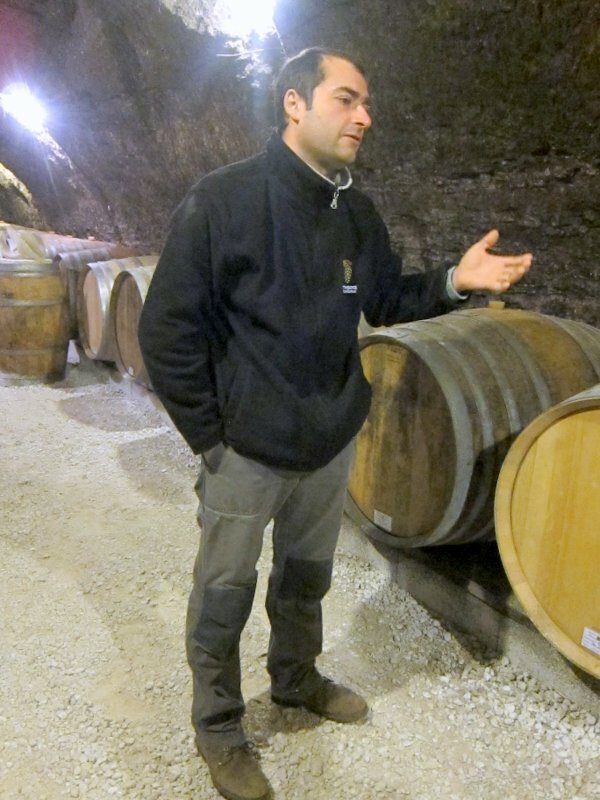 Fermentation and maturation was in French oak barrels, 20% of which were new. There is approximately 4 grams per litre of residual sugar in the Le Clos which is the perfect amount to balance the natural acidity in wines from this region. It is a wine for drinking now or for keeping for five years. A true treasure from the Vouvray appellation.